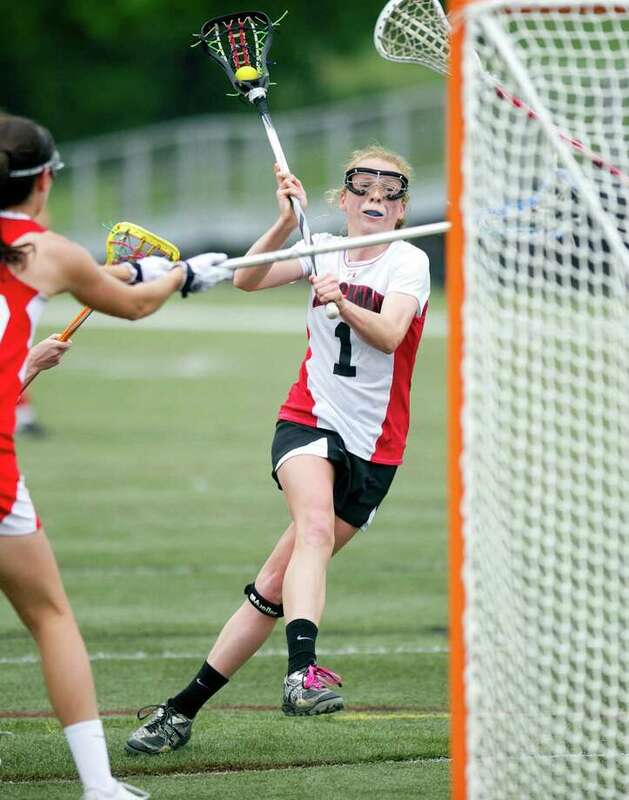 Elizabeth Miller scores a goal during Saturday's girls lacrosse game at New Canaan High School against Fox Lane on May 11, 2013. NEW CANAAN -- The New Canaan girls lacrosse team, with just one loss on the season, is cruising down the stretch towards the FCIAC and class M tournaments. Saturday, the Rams got to chance to face a team from outside the Constitution State and fine-tune their game before their quest for more hardware begins. Elizabeth Miller (four) and Olivia Hompe (three) combined for seven goals as New Canaan used a strong second half to defeat Fox Lane (N.Y.) 11-6 on Senior Day at Dunning Stadium for its sixth straight win. "We kind of took everything at halftime, learned from what we were doing wrong and just adjusted and got back out there," Hompe said. "For the seniors this is our last regular season home game and we wanted to make it count." The teams traded goals in the first half before the Rams (13-1) found their groove in the second. Miller and Brianna McEwan scored 30 seconds apart with under 20 minutes left to extend a 5-4 halftime lead to 7-4. The stingy Rams defense held the visitors to just two goals in the second half as they piled on the offense down the stretch. Five different players accounted for six goals in the final 25 minutes. "Fox Lane is a very strong program; a few of their players challenged us to rise to the occasion," NCHS coach Kristin Woods said. "Our defense stepped up in many circumstances and offensively we possessed and that's a major part of the game. In the first half we were playing a little sloppy defensively. We were fouling a lot and once the second half started we came around and started playing with composure and started playing smart." The Foxes (5-8-2) are one of the top teams in Westchester County and reached the New York State Class B semifinals in two of the past four seasons. Hompe (Princeton) was matched up against fellow Division I commit Kate Burbank (North Carolina) in the midfield and the duo put on a show for 50 minutes, both in the circle and running up and down the field. Burbank netted four goals for the visitors. "I played on a team with (Burbank) over the summer so I know her," Hompe said. "She played a great game. I had some good help from my surrounding defense and we played some really strong team defense with her in midfield because she runs so fast." The highlight of Hompe's day came on an outstanding assist to Bea Eppler that made the score 5-3 in the first half. The Rams hadn't scored in eight minutes and the duo worked an outstanding give-and-go play to find the back of the cage. "I had it behind the goal, (Eppler) gave it back to me and curled around as I took the ball hard and when (the defense) dropped she just kept her stick up and stayed open," Hompe said. "We were able to get the feed through and she made a really nice finish. I love playing with Bea around the crease and I think we work really well." New Canaan, the defending Class M champion, has one game left in the regular season, Tuesday at St. Joseph. The Rams seniors, including Hompe and Eppler, were honored in a pre-game ceremony. The group is one postseason away from completing one of the best four-year stretches in the program's history. "This group is a special group," Woods said of her seniors. "They've been a part of two state championship teams; the only two we've ever had. Hopefully we'll get a third by the end of this year. They're a strong group and nine of them have had a really huge impact on the program as a whole." Records: Fox Lane 5-8-1, New Canaan 14-1. Scoring: FL--Kate Burbank 4 goals; Keely Connors 1g, 1 assist; Lindsay West 1g; NC--Bea Eppler 1g; Elizabeth Miller 4g; Olivia Hompe 3g, 3a; Katie DeMarino 1g; Brianna McEwan 1g. Goalies: FL--Kendall Marianacchi (8 saves); NC--Nathalie Deney (3).